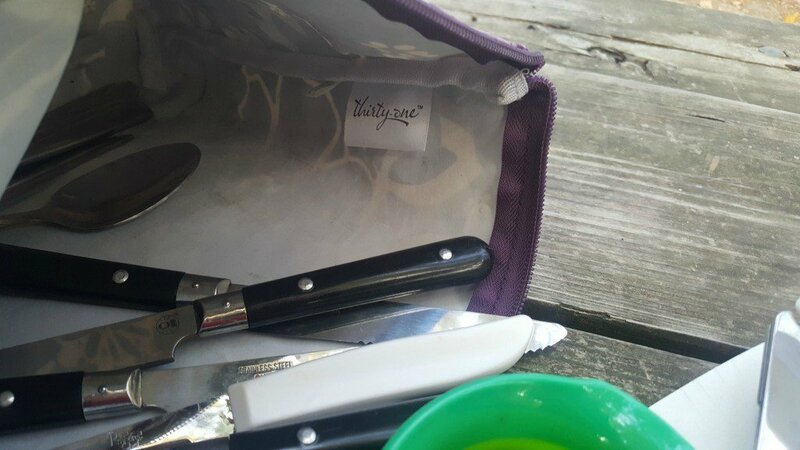 I want to give a HUGE thank you to Thirty-One Gifts for providing some of the products mentioned in this post to use in my van for van camping. All opinions regarding the products within this post are my own. 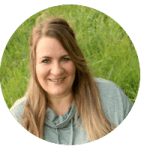 This post does contain affiliate links, but the links to Thirty-One are not. Those are simply there as a courtesy to you. I’ve shared that van camping is my new obsession. Today, I’m going to share some of my favorite new products. 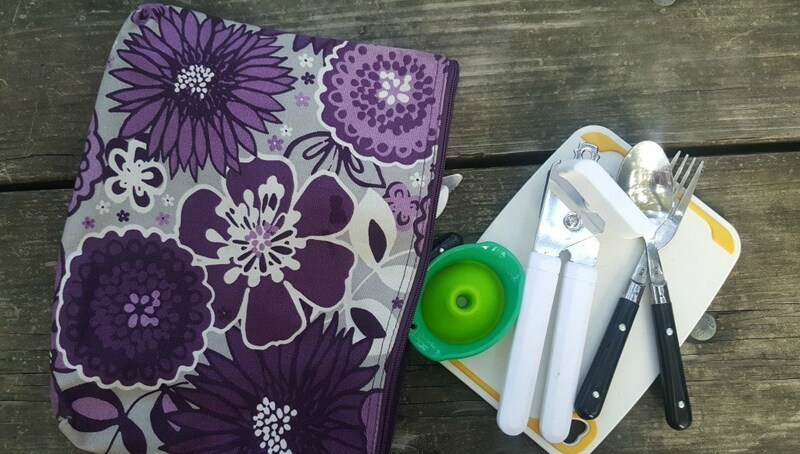 When it comes to staying organized and packed neatly (which is imperative when van camping) I want products that are both functional and pretty. I didn’t need to spend hours searching or traipse from store to store, as I knew Thirty-One would have exactly what I was looking for. A quick look at their website did not leave me disappointed. My husband and I tested our products on our road trip through North Dakota, Minnesota, and Wisconsin. I even filmed a short Facebook Live video to show how we set our van up and offered updates along the way. I admit the things that frustrated us had more to do with me forgetting to pack something like a can opener than it had to do with our storage containers failing us. Which is exactly why I say you need to be organized. Back to my story. My husband works over an hour from home and sometimes, the drive gets to him. 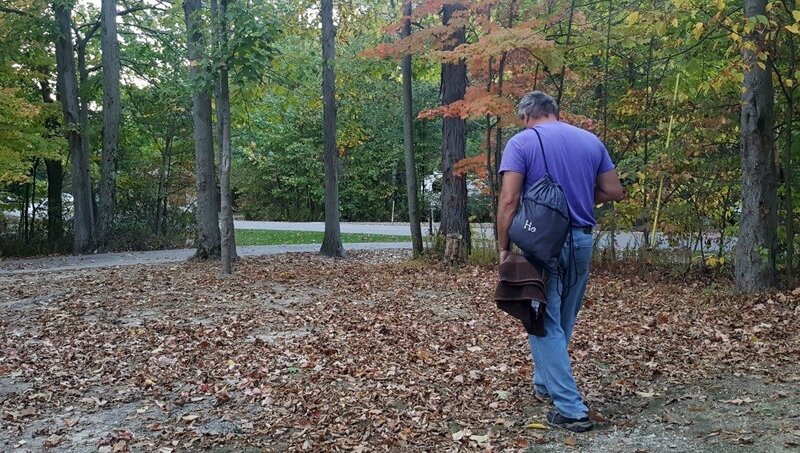 This past fall, he asked me to find a campground close to his job site, so we could van camp and save him the hassle of driving home. 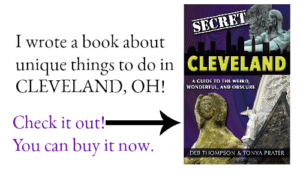 Now, I’m nearly always up for a camping trip and since I’m a fly by the seat of my pants kind of girl when it comes to travel planning, I was happy to oblige. No overthinking needed from me! Our van was still set up for our road trip with our mattress and most of our gear. I was nearly ready to go, I simply needed to pack our clothes and food and away I went. 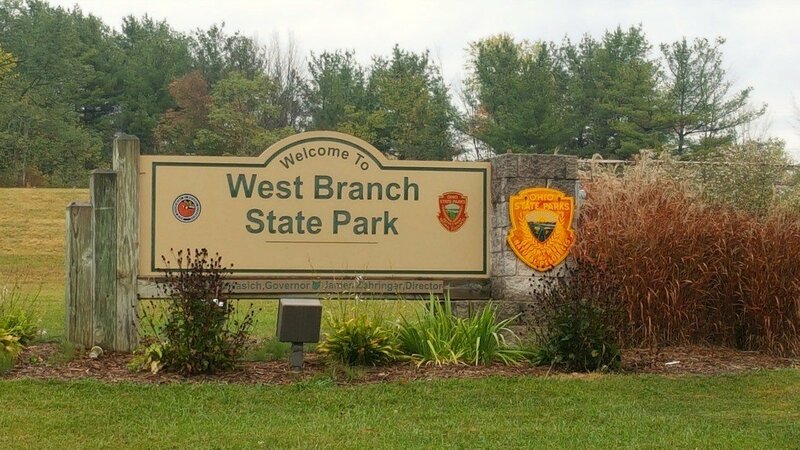 I reserved a campsite at West Branch State Park, one of Ohio’s state parks near Ravenna. 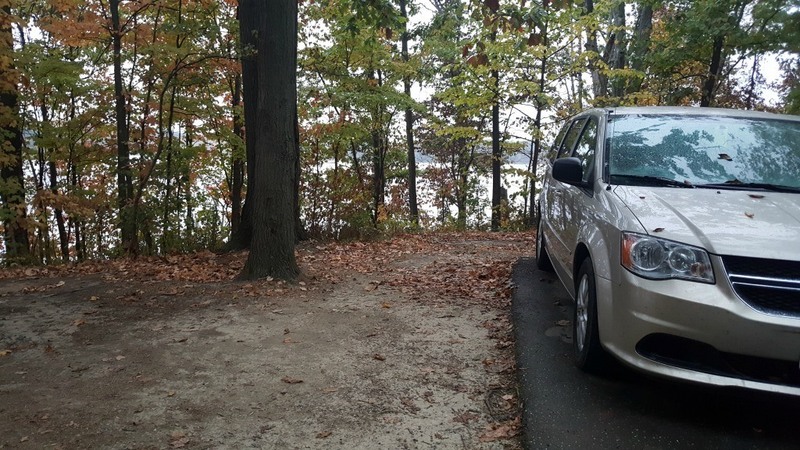 I’d never heard of the campground before my Google search, so I wasn’t sure what to expect and if you’ve spent any time camping, you know not all campgrounds are created equally. Any qualms I had about our campsite were laid to rest when I pulled in and found our site. The campground was very nice, clean, and had the best bathhouses I’ve come across. More on that later. The site I chose (#44) was deep, wooded, and provided plenty of space for both our van and my husband’s truck and trailer. 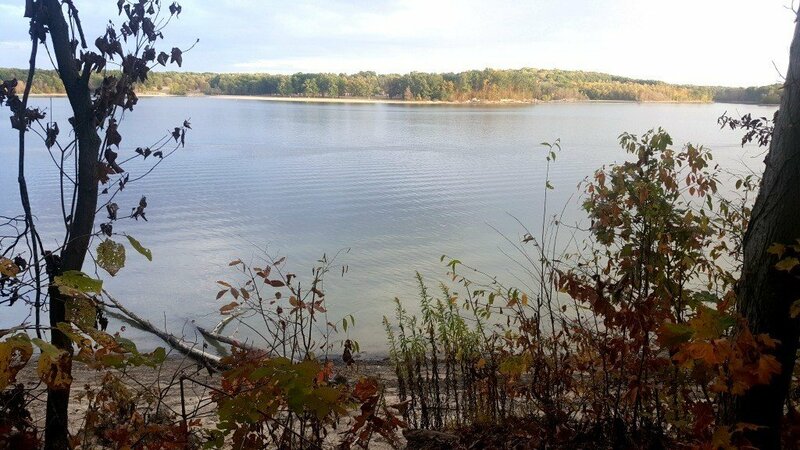 It was also located along the lake. It came equipped with a picnic table and fire ring, though we didn’t use the latter. It was also only a short walk to the bathhouse. While I prepared our meal, my husband traipsed off to the showers to wash up, carrying his Cinch Sac. TIP: To get on the road quickly, I purchased extra toiletries that we keep in our Cinch Sac’s, so they are packed in our van and ready to go. My husband and I can tell them apart because they are monogrammed with “HE” and “SHE”, isn’t that clever? The Cinch Sac comes in handy at the campground and when staying at hotels. On our last road trip, we kept our clothes in the Your Way Cubes. I was amazed by how much they hold and when we stopped for the night, we simply picked out the clothes we wanted to wear the next day and put them in our Cinch Sacs. This saved us from lugging our bulky suitcase around everywhere. My camp kitchen fits easily into the super handy Catch All Bin. I had read the dimensions for the item on the website but underestimated how large it would be- though that was a good thing. You can easily pick it up and carry it when the handle is snapped into place. My container is monogrammed with the word “Weebie,” as the van has been dubbed. 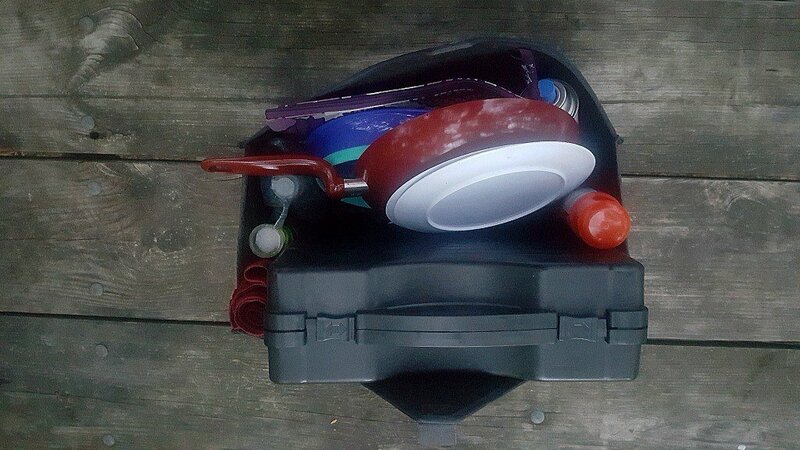 The Catch All Bin easily holds my Coleman Camp stove and fuel, a collapsible bowl, skillet, dishes, spices, and a Zipper Pouch that holds my silverware, knives, mini cutting board, mini funnel, and can opener. I wouldn’t mind having another Catch All Bin for my Cooking in a Hotel Room Kitchen, but that kitchen takes up a bit more space. 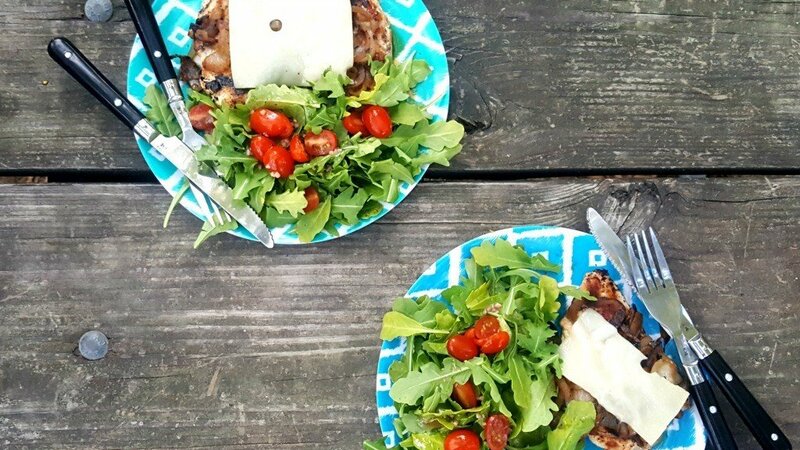 With some simple prep work at home and my trusty camp stove, I was able to create a delicious meal of Caramelized French Onion Chicken with a Baby Arugula Salad and Grape Tomatoes with a homemade salad dressing. 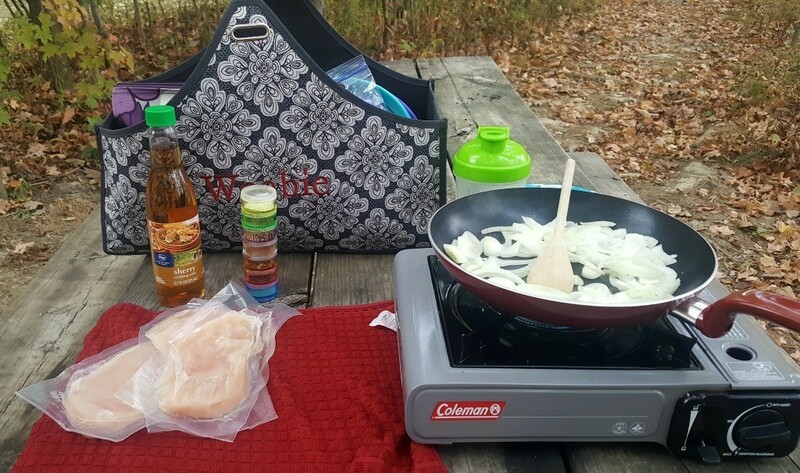 TIP: Purchase the prepackaged, pre-cleaned and trimmed, individually packaged Perdue Perfect Portions boneless skinless chicken breasts to save time when prepping for camping. Camping sure has come a long way since we started out years ago. After dinner, it was my turn to visit the shower house as my husband relaxed in his camp chair. 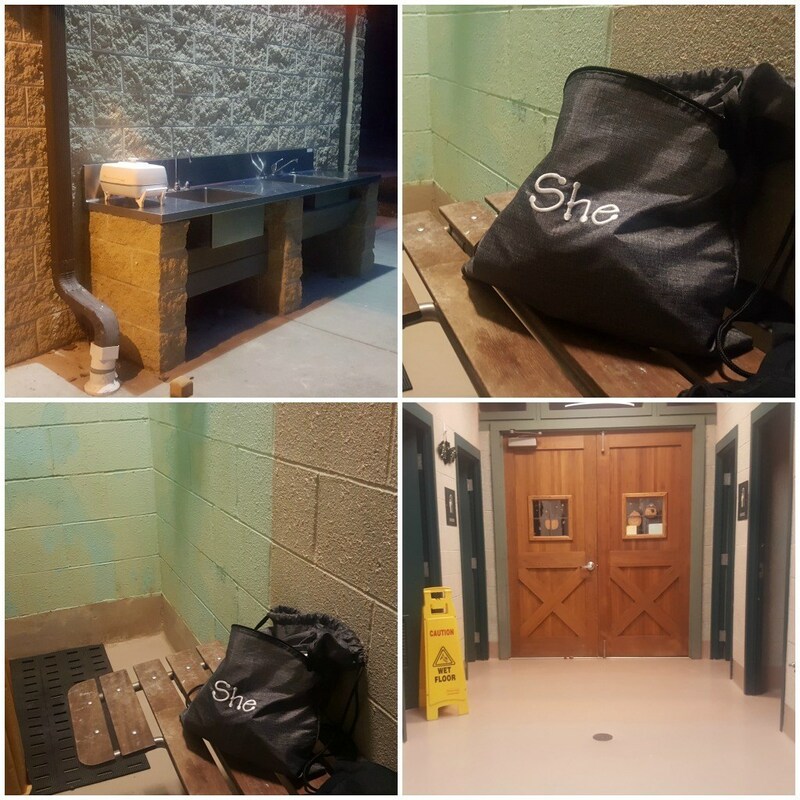 The shower house has sinks outside where you can wash your dishes, laundry facilities inside and very clean men’s and women’s restrooms as well as family stalls. But the feature that impressed me the most was the single shower stalls that featured a floor to ceiling door that locked. 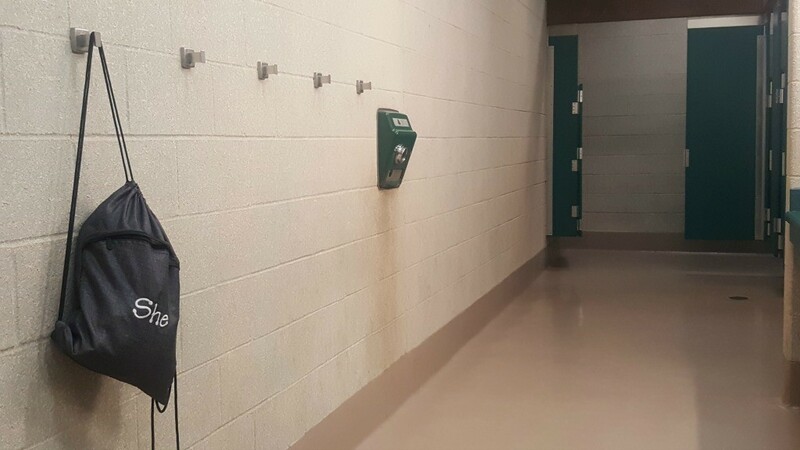 I’ve always detested the semi-private shower stalls that only offer a flimsy curtain for privacy. As the sun began to set on the campground, we crawled into our van to snuggle while we watched This is Us. Yes, I had managed to convince my husband to watch it with me until he decided it was too much like a soap opera. Oh well, it’s probably better that he not watch it with me now since I find myself crying ugly tears after nearly every single episode. It was a work night and it was a HOT evening, so we called it a night with the door of our van open and my husband’s work fan that runs on rechargeable batteries to keep us cool. 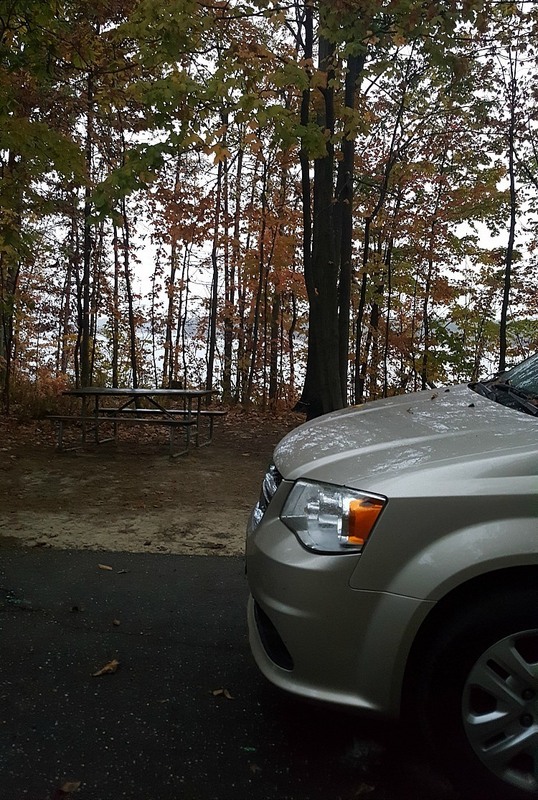 I had hoped to stick around the next day to explore the campground, but we woke up to rain. As my husband drove away to work, I simply drove home. One of the perks of van camping? You don’t have to put a tent up or take it down in the rain. I’ve had that experience and it’s not one I miss. TIP: Forget the tent and buy a van! 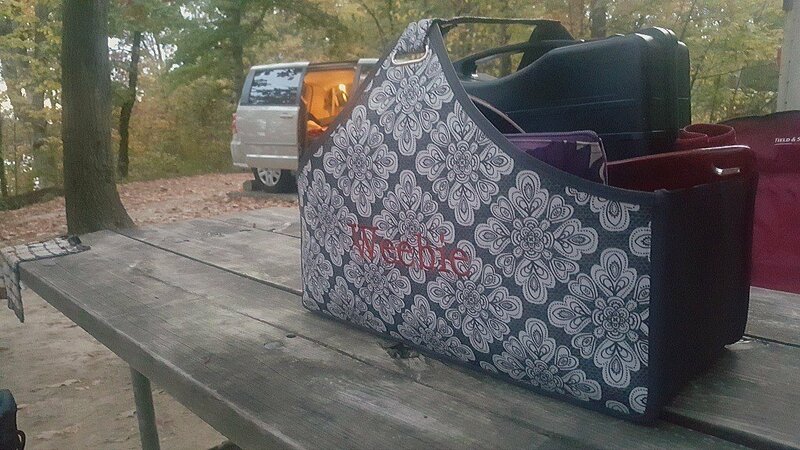 Thirty-One Gifts organizational products are perfect for van camping because they keep me organized, store well and make my van look pretty. That’s a benefit, right? Manny! This is Us and ugly crying was me three weeks ago when I watched the entire season.